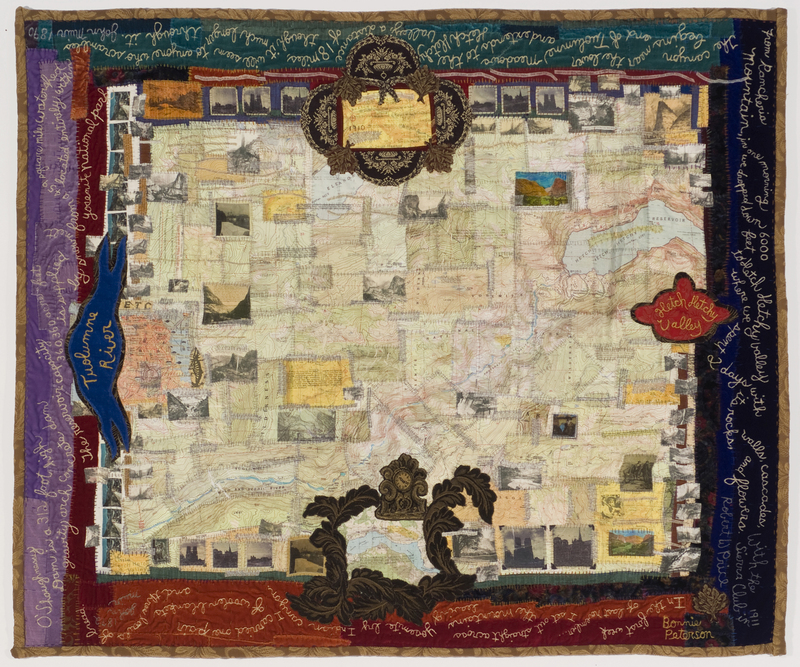 Heat transfers of Hetch Hetchy Reservoir drainage maps, stitching, and photographs of the history of the dam, on satin, silk, sheers and velvet. The borders are embroidered with descriptions of Hetch Hetchy Valley by John Muir and Robert Price from the late 19th and early 20th centuries, and facts about the O'Shaughnessy Dam. Hetch Hetchy Valley is a U-shaped glacial valley similar to and just north of Yosemite Valley in Yosemite National Park. Many of the familiar vertical walls, waterfalls, flora and fauna seen in Yosemite Valley, are present in old photographs of Hetch Hetchy Valley taken before it was flooded by San Francisco in the first part of the 20th century. The fight against building a dam in Yosemite National Park was a major environmental battle in the late 19th and early 20th century. 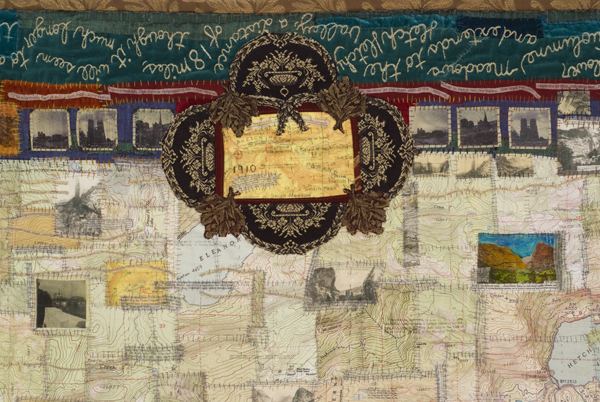 The borders are embroidered with the following text. I visited Hetch Hetchy Reservoir with my 3 small children in August, 1997 during a 3 week artist residency at Yosemite N.P. It took a few hours to get there by car. The road exits and reenters the park, and bumps along on unpaved roads. It seemed like it was twice as hot at the reservoir, as it had been in Yosemite Valley. We parked and walked to the far side of the dam and through a cool tunnel and along a service road towards the falls. We sat down on the road to eat a snack and draw - each of the kids with their own sketch book and drawing materials. A ranger approached on horseback and asked if we needed anything. My 7 year old son looked up and said, "we are artists."